The events occurred in the Cathedral of Montichiari and in Fontanelle, and the messages witnessed by Pierina Gilli are currently to be considered as a pure personal experience.. Therefore, what is here reported for information purposes only, remains under the sole examination of the Ecclesiastical Authority, without misleading the faithful into thinking that the judgement of the Church in relation to the events occurred had been modified in a positive way by the Holy See. Pierina was born in Montichiari on 3rd August 1911, first of nine sons, in a humble family of farmers. She grew devoted to family, work and prayer, bearing with patience the poverty and the weak health. Her father’s death intensified her sufferings and forced her to enter the orphanage in Montichiari, run by the Sisters of the Handmaids of Charity. Even if soon she matured a vocational thought, her desire of entering the religious institute founded by Crocifissa di Rosa never came true, due to the continuous delays caused by sudden illnesses and severe misunderstandings. When she was about 30 years old, suddenly Pierina Gilli became protagonist of deep spiritual experiences connected to the devotion to Mary Rosa Mystica, who at present is known all over the world, and in this faithful witnessing she received her definitive Cross, made of other several physical and moral sufferings. In the night between 23rd and 24th November 1946 – when her suffering reached her culmination due to a serious illness- Pierina had the grace to understand in depth the spiritual experience of Maria Crocifissa di Rosa, the blessed foundress of the Sisters of the Handmaids of Charity and her particular preference for the suffering. Through the immersion in the spirituality of Maria Crocifissa di Rosa, Pierina understood she had to dedicate her life to the Virgin Mary, offering in particular “prayers, sacrifices and sufferings” to repair the sins of three categories of souls consecrated to God: the religious souls who betray their vocation; the religious souls in mortal sin; the souls of priests who betrayed becoming unworthy of their sacred ministry. Furthermore, Pierina understood she had to contribute to the sanctification of the priests through prayer, sacrifice and penitence of the faithful. On 13th July 1947, during the night prayer together with the Sisters hosting her, Pierina had the intuition of the image of the Virgin Mary, dressed in white, with three roses on Her breast: the white rose would have indicated the spirit of prayer, the red one the spirit of sacrifice and the yellow one, with golden reflections, the spirit of penitence. In that circumstance Pierina had the intuition that the 13th of each month, a day of Marian prayer with a special solemnity had to be celebrated. In the following months, Pierina continued to deepen her intuitions in the light of Fatima’s spirituality. On occasion of the solemnity of the Immaculate, on 8th December 1947, she understood that great spiritual fruits could come out from the celebration of what she called “hour of grace, penitence and prayer” in favour of conversions, especially for the religious souls. During that very day, on 8th December 1947, in Cathedral of Montichiari, Pierina understood she had to dedicate herself to the Immaculate Heart of Mary, founding her own spirituality on the Marian title of “Rosa Mystica”. Due to the persisting Pierina’s fragile state of health, a group of charitable persons took care of the lodging of her and, at last, she was temporarily accommodated at the Convent of the Franciscan Sisters of the Lily in Brescia on 20th May 1949. This temporariness lasted 19 years, during which Pierina deepened her Marian spirituality with particular attention to the devotion in the sanctuary of Lourdes, to the sick and to the intuitions had in 1947, with reference to Mary, Rosa Mystica. This sensibility will lead her to find in Fontanelle a place suitable for developing initiatives of reception and prayers for the sick, to be dedicated to Mary, Rosa Mystica. On 17th April 1966, the first Sunday after Easter, called in albis, Pierina has the intuition to invite all the sick to go to the miraculous spring to receive mercy and consolation. 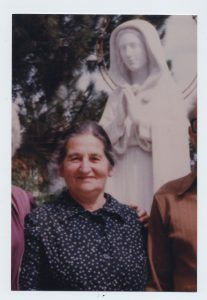 On 13th May 1966 Pierina thought that the source could be called “Spring of Grace” and to build a basin to receive the sick. During the Solemnity of Corpus Christi, on 9th June 1966, in the fields of mature wheat, Pierina had the intuition of the deep connection between the Marian spirituality and the Eucharist: the Eucharistic Bread was nourishment for so many repairing Communions. In the following Solemnity of the Transfiguration, on 6th August 1966, Pierina had the intuition that on 13th October the world-wide day of the Repairing Communion could be celebrated. Pierina lived humble in her daily life and, even obeying always at the Ecclesiastical provisions, she remained a reference point for the more and more pilgrims arriving in Montichiari attracted by devotion to the Virgin Mary. Pierina welcomed them patiently in her small house near the new hospital, ready to intercede in favour of the persons who asked her prayers. She gave consolation and advices to many of them, and prepared a lot of hearts to conversion. Pierina helped in particular the sick, for many years, until 1990 when her illness got worse and she was forced to remain on a wheelchair. On 12th January 1991, Pierina died after a long purification of body and spirit. In the presence of a large crowd of faithful, arrived for the final farewell, her funeral was celebrated. She was accompanied outside the Church until the cemetery, where she is still buried, with the sweet words: «Oh Mary, our hope, you help us and think of us…». The same words that the little nurse assistant had dared to sing on 8th December 1947 at 12 o’clock, illuminated by Rosa Mystica, in the big Cathedral of Montichiari. The testimonials of miracles and marvels obtained through the intercession of Mary Rosa Mystica arrive from all over the world.